For most of the 54,000 people who take part in the Bupa Great North Run, the 13.1 mile route from Newcastle to South Shields is a challenge. But for one man, doing it just the once was not challenging enough. Tony Phoenix-Morrison, from Hebburn, is undertaking the gruelling task of running the route of the half marathon everyday for 30 consecutive days with a 6st (40kg) fridge on his back. Currently on day four of the challenge, he is determined to continue despite his mother having a heart attack at the weekend. The 48-year-old said: "It's [the run] going fantastic. The challenge was always going to be painful, which it is constantly, but that is the challenge and I'm just going to live with it, I'm not going to moan about it. "I have a huge swelling on my back already and friction damage but weirdly, at some points in the run it actually feels weightless. "There's a point when you're running when you're in mid air and at that point your weightless and there's no pain, so I like to focus on those bits rather than the next bit when you hit the ground and it hurts." Going by the name Tony the Fridge, he is doing the challenge to raise money for the Sir Bobby Robson Foundation after he lost his grandmother Sheila Taylor to cancer when she was 52. 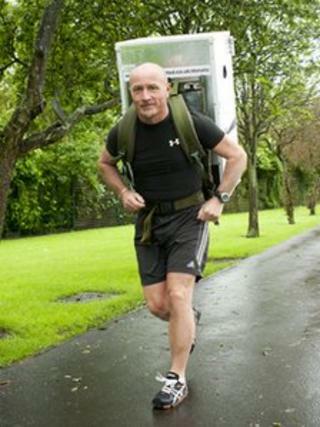 He has previously ran the Great North Run 16 times and ran with a fridge on his back for the first time last year. Tony the Fridge is setting off at 06:00 BST each day and will run along the same route so people can join in or cheer him along. He is aiming to complete the route in 2hrs 45mins each day. "The plan is that I am going to run it at a pace so that hopefully the very last mile that I run will be at the same pace as the first mile," he said. "I'm really just trying to stay in a zone where I am comfortable and able to continue. "The reaction has been amazing, I love kids because they just laugh at me which I think is funny and all the Geordie white van drivers going to work are probably the best, shouting all kinds of brilliant things out of the windows." The 48-year-old said in the fridge there were some bacon and eggs so he could make breakfast at the end of the route and it has holes in the side for donations.